This morning, Walter, the Communications Director of the National Heritage Board (NHB) was sharing with me a new initiative that they are rolling out. I am one of those who had always think of museums and anything that has the word “heritage” as “boring and old”. So, imagine my surprise when I first met Walter at a new media conference and he was one of the panel speakers. He was sharing a case study about how the NHB makes use of the social/ new media (by setting up a blogsite – Yesterday.sg) to reach out to more Singaporeans (especially the younger and tech savvy people) as well as anyone who’s interested in the heritage of Singapore (like Jon who’s British – he knows more about Singapore’s history than me). The new campaign is called Explore Singapore! and is ongoing from now until the end of December. There are more than 86 activities to choose from. Some of you (who are Singaporeans) probably would have read or heard about Mark Lee, our local celebrity who is engaged to host the tours at Singapore’s oldest museum. The interesting part of this is, there will be a Heritage Photoblogging contest where you can win brand new Nikon Cameras including a D40 kit! The idea is not new but when I think about it, it’s a great move for NHB to get the old and the young, the tech savvy or not-so savvy folks to (1) join in the fun by attending those activities, (2) show-off your photography skills and (3) some great content to put up on the blog and of course, most importantly (4) win a new Nikon camera. If you are interested, here’s what you can do! 3) Visit the Explore Singapore! 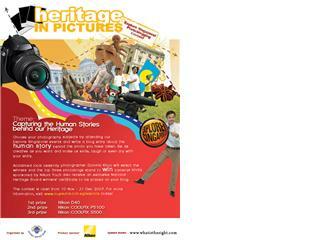 Heritage In Pictures webpage. Register your blog post URL there. 6) Get your friends to check out your entry by putting this Brag Badge on your blog. Celebrity photographer Dominic Khoo of www.whatisthesight.com will select the winners, who will receive an exclusive National Heritage Board winners’ certificate to be placed on their blogs. Registration is open from 10 November 2007 to 31 December 2007. Since I have some time in December, I might just bring mummy along to a few of those activities. This entry was posted in Marketing & Communications, Technology & Digital and tagged consumer campaign, museums, National heritage board, Photoblogging, Singapore, Social Media by Priscilla Tan. Bookmark the permalink.